A natural disaster is a major adverse event, resulting from natural processes of the Earth; examples include floods, volcanic eruptions, earthquakes, tsunamis and other geologic processes. Although they are called natural disasters because no man directly ignites them, a lot of them can be traced to the indirect or ripple consequences of man’s activities on earth. 10 most fatal natural disasters that have shaken some parts of the African continent. A persistent absence of rain which began in late 2010 took its toll when between July 2011 and mid-2012, a severe and massive drought affected the entire East Africa region, specifically in Kenya, Somalia, Ethiopia, Eritrea and Djibouti. The drought which was said to be “the worst in 60 years” plunged East Africa into the worst food security crisis Africa has faced over some decades. Somalia was one of the hardest hit areas and food and water became extremely scarce in the area. A collaboration of failed rains, high food prices and regional conflict created a “deadly combination” for the region at the time. The United Nations declared parts of southern Somalia to be official famine zones. During the summer, nearly three million Somalis were in need of medical assistance. 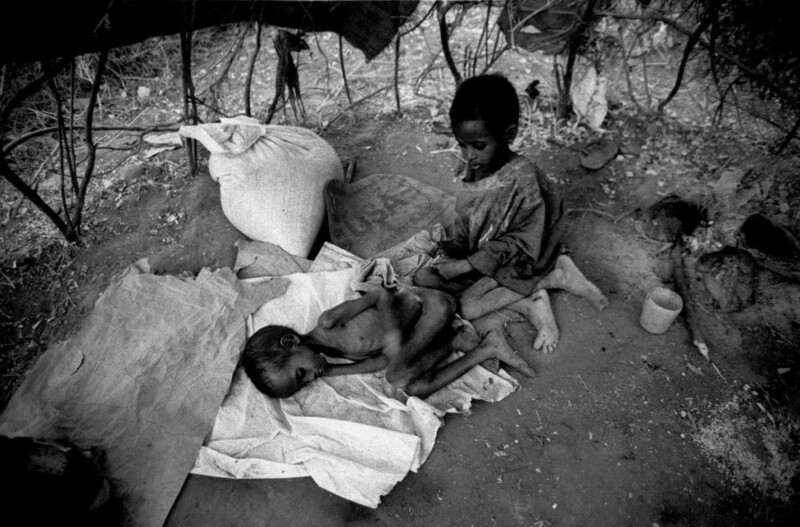 It was estimated that between 50,000 and 100,000 people, more than half of them children under five, died due to famine. A volcano erupted in the Southern Red Sea Region of Eritrea, in 2011. It was the Nabro stratovolcano and it started erupting on 12 June, spewing ash over hundreds of kilometres, affecting food and water sources as well as air travel in some parts. The adverse impacts of the volcanic ash increased reports of livestock mortality, migration, critical water shortage, human health problems and rising malnutrition among the worst volcanic affected woredas [districts]: Bidu, Afdera, Erebti, Elidar, Teru and Kori. By 20th June, eight villages in the Biddu district of Ethiopia were covered by volcanic ash, affecting at least 5,000 people and polluting springs and streams. The ash cloud from the eruption reached altitudes which disrupted airline traffic in the region. A devastating flood occurred in South Africa, early 2011, following series of heavy rain which lasted several weeks. The flood was also associated with the global weather pattern prevalent at that time, known as La Niña. Botswana was particularly badly hit, receiving 75 percent of its yearly rainfall in three days. The flood caused the loss of about 500 lives and more than 6,000 people displaced or evacuated. The destructive aftermath of the flood include the closure of 630 schools and 42 health units (including Beira Central Hospital, the second largest in the country). The floods in Mozambique took place in the early months of 2000. Over the course of February and March, large parts of Africa experienced incredibly heavy rainfall. Flooding was soon all over the country and because of the relentless rain, eight hundred people lost their lives. The damages were immense, with lost land and homes all over the country. The flooding was said to be the worst the country had suffered in fifty years. The damage was encompassing, with affected areas almost completely destroyed. Farmlands and crops which villages relied on for survival were submerged in the waters. Many families were totally stranded with no food or clean water, so, hundreds died from starvation and over forty health stations were completely destroyed, including the second largest in Mozambique. Irrigation systems all over the country were ruined which was one of the main reasons for the loss of agriculture. Over one hundred thousand farming families had lost their livelihoods, with nearly fifteen hundred square kilometres of land almost destroyed. But it was not only the crops that were damaged. Twenty thousand cows were either swept away by the flood waters or died from disease shortly afterwards. In the aftermath, four hundred and fifty million dollars was required to rebuild after all the damage. While most earthquakes in the past have not caused as much damage in Africa as in other parts of the world, the 1966 Toro earthquake was particularly devastating for Uganda and the Democratic Republic of Congo. On March 20, 1966, a 6.8-magnitude, 3-5 minute earthquake hit the border between the two countries towards the south of Lake Albert. The quake was so intense that the impact was felt as far away as Tanzania, Rwanda, Burundi and Kenya. More than 157 people were killed in the initial quake: 104 in Uganda, 1 in Tanzania and 52 in the DRC. However, more people died in the coming months as a result of aftershocks, (especially that of May 18 of the same year which claimed 90 lives in the DRC). This aftershock caused damage to buildings in both Uganda and the DRC. A widespread famine affected the inhabitants of today’s Eritrea and Ethiopia from 1983 to 1985. The famine was the worst to hit Ethiopia in five decades then. The famine which lasted for two years claimed about 400,000 lives. In addition to hundreds of thousands of deaths, millions were displaced and made destitute. The economy of Ethiopia is based on agriculture: almost half of GDP, 60% of exports and 80% of total employment come from agriculture. That was why, when drought struck, the impact on the lives of the people was massive and fatal. Prior to the famine, two decades of wars of national liberation and other anti-government conflict had raged throughout Ethiopia and Eritrea. The conflict made the impact of the drought to be more deadly than it would ever have been. Parched countryside, bare hills – weary and weakened men, women and children congregated in places they thought they might find food. Thousands were dying every week. An extremely devastating earthquake struck Agadir, a city located in western Morocco on the shore of the Atlantic Ocean on Monday, February 29, 1960. Most of the “new town” area of Agadir comprising mainly of Founti, Kasbah, Yachech and the heavily populated Talborjt quarter were believed to have been the hardest hit and completely destroyed with more than 95 percent of the people in these areas killed. Although it was a very short-duration quake which lasted for barely 15 seconds, it left around 12,000 people (about a third of the city’s population of the time) dead and another 12,000 injured with at least 35,000 people left homeless, making it the most destructive and deadliest earthquake in Moroccan history. Generally speaking, it may be concluded that the Agadir earthquake of February 29, 1960, was one of the most devastating local quakes of all times. Within a period of a few seconds and over an area of only a few square miles, the bulk of the city of Agadir was completely destroyed and over a third of its citizens killed. The total number of casualties will never be known as thousands of bodies could not be recovered from the debris. But a reasonable estimate has indicated at least 12,000 killed and 12,000 wounded. The AD 365 Crete earthquake was an undersea earthquake that took place at about sunrise on 21 July 365 in the Eastern Mediterranean, with an assumed epicentre near Crete. Geologists today estimate the quake to have been 8 on the Richter Scale or higher, causing widespread destruction in central and southern Greece, northern Libya, Egypt, Cyprus, and Sicily. In Crete, nearly all towns were destroyed. The Crete earthquake was followed by a tsunami which devastated the southern and eastern coasts of the Mediterranean, particularly Libya, Alexandria and the Nile Delta, killing thousands and hurling ships 3 km (1.9 mi) inland. The tsunami in AD 365 was so devastating that the numerous writers of the time referred in their works to the event and the anniversary of the disaster still commemorated annually at the end of the 6th century in Alexandria as a “day of horror”. Indeed natural disasters can destroy a beautiful city within a twinkle of an eye.